In his recent testimony in front of the US Congressional committee, Facebook chief Mark Zuckerberg was questioned about the trade of illegal products on Facebook groups including firearms, controlled substances, and even animals. While Zuckerberg promised to take the necessary steps, he might not have imagined that Facebook groups could be even more dangerous and pose a threat to the identity and the social existence of its users. We’d already seen how Facebook groups have been trading stolen credit card data as well as social security numbers. 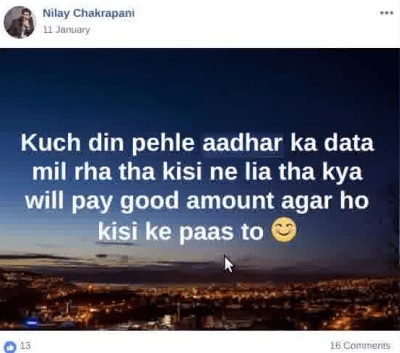 Alt News, which is well-known for provocative exposes, has made another disturbing revelation about the sale of fake Aadhaar cards and other government-issued ID proofs on closed Facebook groups. One such group is “Help for Friends – Advertising Deals” which has more than 7,000 members. Being a private group, it cannot be searched and you’ll need an invite from a friend to be part of this glorious group. This, as per the report, is a “close-knit circuit” of those trading a variety of illegal documents. Not just documents, you can find pre-activated SIM cards and even services such as illicit biometric authentication. 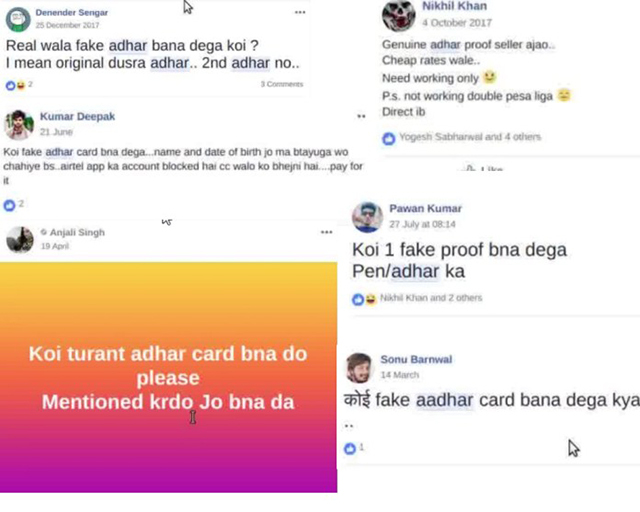 Due to the two-pronged nature of Aadhaar, buyers can use these fake UID cards without the need of any online verification or OTP. Meanwhile, there are several others seeking or supplying fake PAN cards and drivers’ licenses. 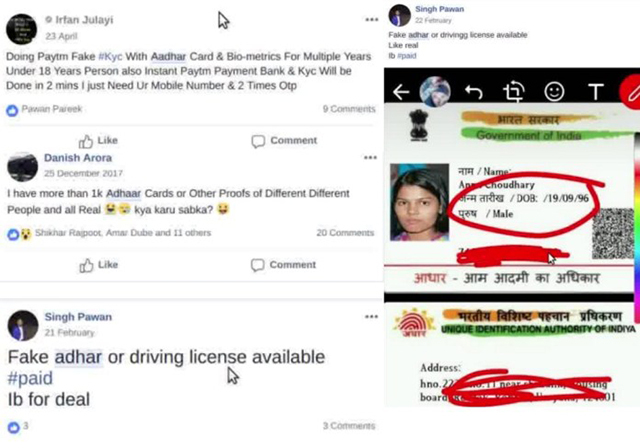 Besides individual ID cards, many others could also be seen trading entire databases of Aadhaar, which I’m sure they did not have to pay a challenging price for. 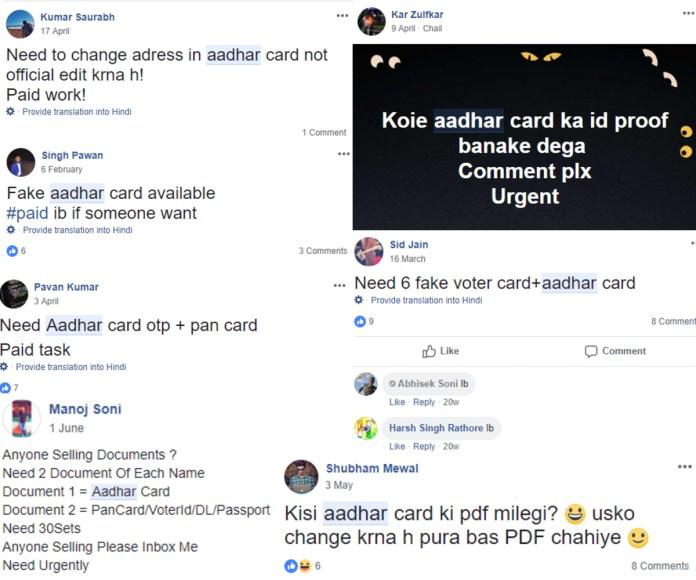 There seems to be a lot of demand for editing Aadhaar cards, and anyone even with minimal experience with Photoshop knows one need not be a pro to make these trivial changes. Besides Help for Friends, Alt News also discovered another close-knit private group by the name, “Sharing is Caring” which is used to trade popular Instagram accounts or Facebook pages which deal with topics like Bollywood, cricket and Indian army. 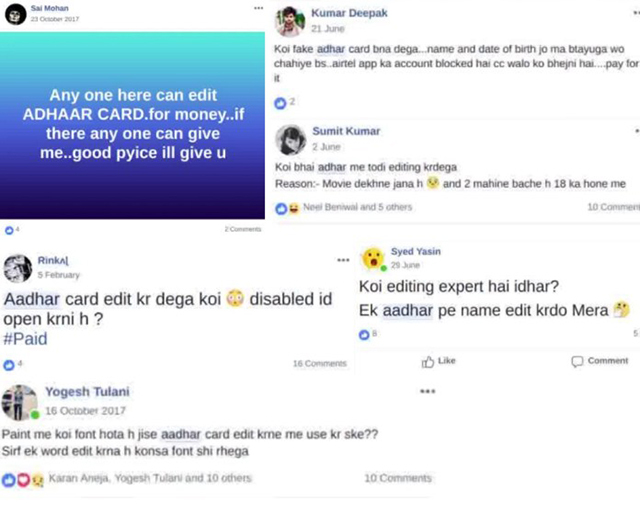 It also contains a small number of posts about selling fake Aadhaar cards and other IDs. All in all, while there has been oversight from Facebook and overconfident claims by government representatives, it’s not just fake news that users have to be worried about on Facebook.